Age-related macular degeneration (AMD) is the leading cause of blindness in the United States. Macular degeneration is caused by the deterioration of the central tissue of the retina, which records the image we see and sends them to the optic nerve from the eye to the brain. This central portion of the retina is known as the macula, which controls our ability to read, drive a car, recognize faces or colors and sees fine detail. 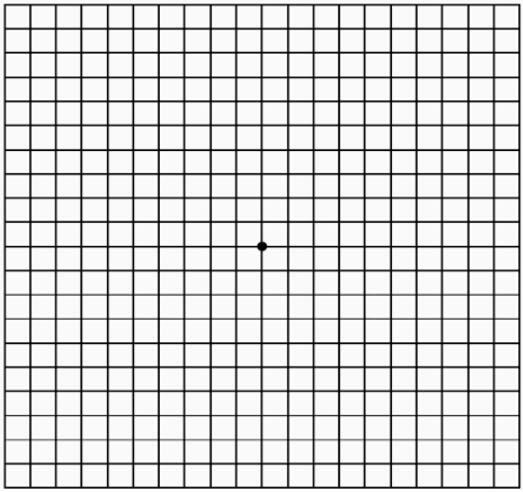 Macular degeneration may cause blurring and distortion of the central vision in the eye. The words on a page may look blurred or wavy and straight lines may look distorted. In dry AMD, which affects 85-90% of Macular Degeneration patients, central vision becomes impaired as the cells beneath the retina gradually lose function. Yellowed deposits, called Drusen, are found under the macula that leads to thinning and drying out of the macular tissue causing it to loose function. In wet AMD, which affects 10-15% of Macular Degeneration patients, abnormal blood vessels grow beneath the retina and macula where they eventually leak and bleed. These vessels, called choroidal neovascularization, cause bulging and swelling of the retinal tissue that causes distortion and can destroy the central vision. This type of neovascularization can cause scar tissue may form in these affected areas. Wet AMD may cause sudden, permanent visual loss. Fortunately, wet AMD can sometimes be treated with laser surgery or medication. Some patients do not notice any vision loss or change with dry or even sometimes wet macular degeneration. Early detection and treatment can help save your vision; so regular eye examinations are key in diagnosing AMD as yearly as possible. While dry AMD does not have a cure or an effective treatment, some dietary supplements have shown promise in reducing the risk of disease progression. At Eye Physicians of Northampton, our ophthalmologists can help patients monitor their condition and learn how to use low-vision aids to help with reading and other tasks. We will also share the most up-to-date information and treatment options as they become available.